I was in the Birmingham Selfridges the other day, ruing that it is a pale imitation of the Proper Selfridges when these beauties caught my eye and made me go "Ooh!" The actual structure of the shoe appears quite delicate but the squared toe and chunky sparkles give it a femininely tough edge. I particularly love the heel - it's not too high and perfectly shaped. 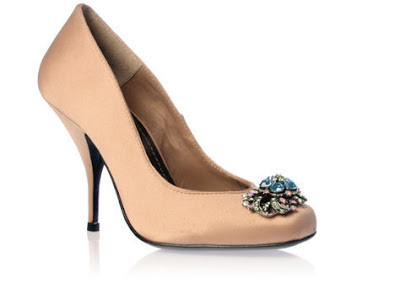 As well as this muted pink, it comes in black but that just makes it any other shoe.